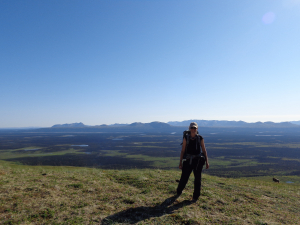 Embark into the Alaskan wilderness with a team of all female Alaskan guides. 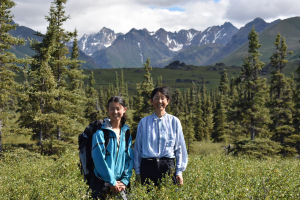 Experienced backpackers and guides Margaret Stern and Caity Potter take you on their favorite introductory route into the foothills of the Alaska Range. Travel through the woods, over upland tundra, to river bottoms and alpine meadows. 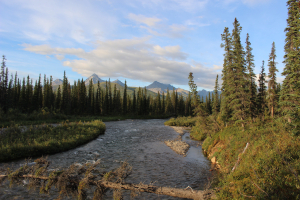 Experience the Alaskan wilderness while forging friendships to last a lifetime! This trip is designed to be enjoyed by novice backpackers and veterans alike. The mix of tundra and woodland, creek and river crossings, ridge top and lowland keeps each day fresh and exciting. Views all along the route are expansive and exceptionally breathtaking. Your guides’ knowledge about the plants and wildlife will add and enrich your appreciation of this magical, wild landscape. Food, Snacks, Lodging, and Transportation to and from the bush included. Group gear also provided. 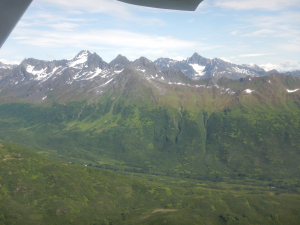 June 22: Fly into the homestead from Anchorage. 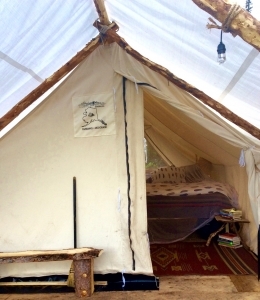 Settle into your cozy wall tent at the homestead. Meet the animals, take a welcome tour of the facilities, garden, property and gorgeous creeks. Enjoy a welcome dinner around the campfire, getting to know your group for the trip. June 23: After breakfast around the campfire, head out for a morning welcome hike along our creek. Along the hike, circle up, talk about safety, review the map of our route, and learn about route finding, map reading, and backcountry navigation. Return to the homestead for a picnic lunch, and a final review of gear. Backup. Eat another dinner by the campfire. June 24: Wake up and enjoy a quick breakfast before hitting the trail. Leave the homestead and snake your way through aromatic boreal spruce forest on a well established trail. 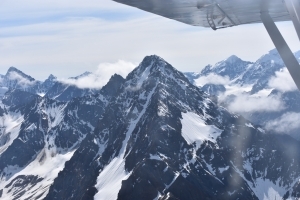 Break out into alpine tundra with views of an unnamed section of the Alaska Range and the Revelation Mountains. Stop for a picnic lunch and explore massive glacial erratic boulders. 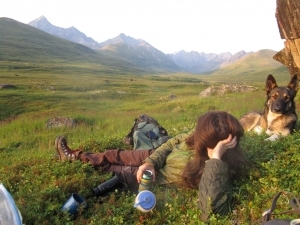 Climb to boulder tops, nap in the tundra, spot wildlife and learn about wild plants. 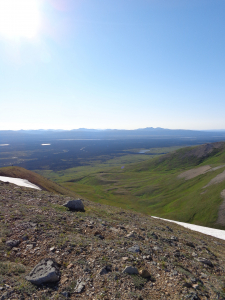 Caribou, grizzly bear, moose, wolf, lynx, frequent this landscape. Keep your eyes peeled! After lunch, continue your trek up into the valley. Camp with views of rugged peaks next to the sweet smell of cottonwood trees. A stream lulls you to sleep. 3-4 mile day, route subject to change. June 25: After your first night camping out, eat breakfast and reload your packs. Head higher up into the alpine environment. Explore hanging valleys, watch for wildlife, traipse past diminutive alpine vegetation while taking in expansive views of an ancient river valley. 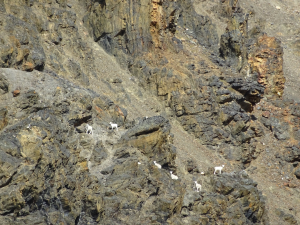 At this point, three different mountain ranges can be seen from the trail. Eat lunch at a high alpine meadow, relishing a backcountry meal. Glass for moose in the bogs and meadows below. Watch the light play against the mountains. After lunch, descend into the valley to meander through gnarled old growth forests. Note the changing plant habitats as you walk, and the different geology. 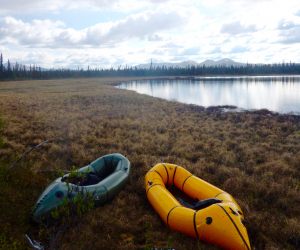 After turning a corner on “Caribou Cut,” make camp in a meadow next to an alpine lake. 6-8 mile day, route subject to change. June 26: After another peaceful night of camping out under the midnight sun, continue on the trail for a day of beautiful views. 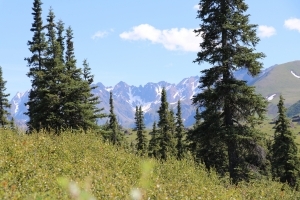 Continue your trek through varied old growth boreal forest, open tundra and whimsical stands of krumholz cottonwoods. Explore an old cabin miner’s cabin, look for fossils in rock outcroppings, and watch beavers play in their ponds. Pop out of the forest into open meadow tundra. 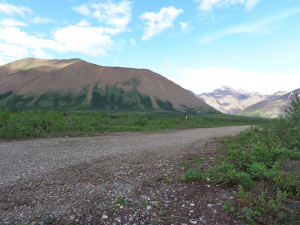 After a mile we arrive at a remote bush Alaskan airstrip. There is a bear proof barrel at the strip containing our resupply. After packing up the resupply, prepare to cross the braided, glacially fed North Fork of the Big River. After the cross, make your way to the nearby Big Bear Creek. Hike a few miles up the inviting gravel bars of Big Bear Creek to your campsite. 4 miles with river crossing. 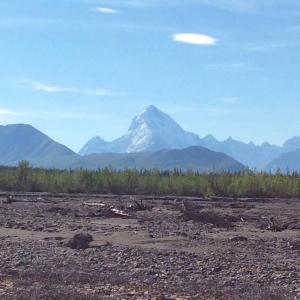 June 27: Wake up to massive views of glaciers, unnamed mountain peaks, and the Revelation mountains. Today we take in the beauty of this magical creek. It’s size will amaze, resembling a river from the lower 48. Watch for animals and wild plants. Choose to explore or relax in camp. Take in the rugged wilderness that you have reached by your own two feet! Some may wish to relax, some may wish to explore this beautiful area. June 28: Our last day in the field. Cross Big Bear Creek and make your way 1000′ up and over an alpine ridge on game trails. At the top of the ridge, stop for lunch to observe wildlife and take in views of the epic Mt Hesperus, several glaciers the Revelation Mountains. Drop back down the side of this unnamed ridge, and skirt the bottom of the mountain. Arrive at a luxurious remote lodge for showers, comfortable beds, hot meals, and a sauna. 2 moderately steep miles. June 29: This is our day to relax and celebrate! Sauna, packraft in the lake, and read your book on the deck. Take in epic mountain views, and drink tea with new friends. Relive memories, and enjoy your last day with this Alaskan Wilderness Sisterhood. Finish the night with a celebration dinner and awards ceremony. 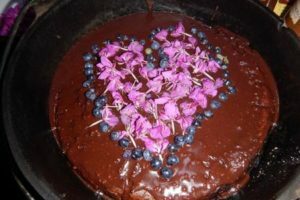 June 30: Farewell breakfast. Enjoy a hearty breakfast while waiting for your transportation back to Anchorage. Take in the views, exchange hugs and tears, and say goodbyes. Continue your Alaskan Vacation, or head on home with dirt on your boots, fantastic memories, a new accomplishment and dear friends. 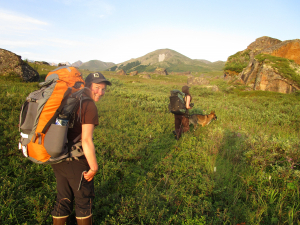 Transportation to and from the bush, lodging while in the bush (Homestead and Lodge), all meals and snacks, group gear, expert guiding, lessons in natural history and wildlife biology, an unforgettable Alaskan adventure! You want a unique way to experience the Real Alaska, off the beaten track. You desire an adventure away from the bustling road system. You are looking to learn about backpacking. You are capable of carrying a 35-40 pound pack over uneven terrain. You have a thirst for adventure, a willingness to challenge yourself, and desire to make new friends.